Not just because it is snowing so much here that they have closed our mall and TJ MAXX early today, but because we finally replaced our brokedown living room windows with a set that OPENS. Seriously, they go up and down and tilt in and everything! As you can see from the next few shots, we tried valiantly to strip these windows from the layers of paint slopped all over them. They were completely painted shut, and no matter what we did, we couldn't open them. A whacked-out previous owner had painted these solid original windows with a bright terra-cotta paint. I also know which one, because our lovely neighbor Margo told us the harrowing story of being invited over so 'boozy Susie' could show her the 'fab new trim paint'. Margo could only stare in disbelief. Much like we did while trying to remove it. There was so much paint, we just kept scoring the poor sash with a utility knife (in the wrong place) and ended up cutting the bottom of the sash off. Duh. This was the most costly, stupid, 'HBO-passing-on-Mad-Men' type of mistake we made in this house, hopefully there won't be more of those dumb mistakes in our future. Rather than try to cobble the window back together, we decided to replace the set. We hemmed and hawed about windows for over a year because the choices are so mind-boggling, then I finally put my foot down and chose what I wanted. 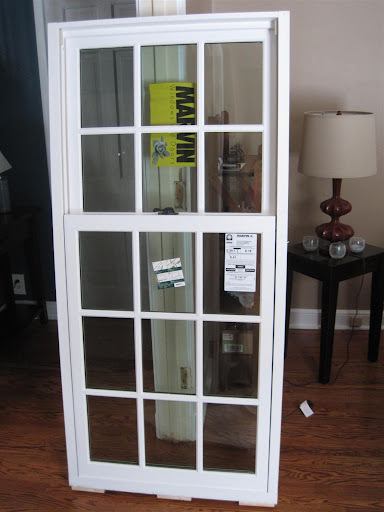 I picked the Marvin Ultimate Insert (replacement) Double Hung Windows, with wood interior and aluminum-clad exterior. Leave it to me to pick out the most expensive option. You know I sprang for the Oil Rubbed Bronze latches instead of those boring 'taupe' ones! Why wood? Well, for our house, they just look better than vinyl. Some people on my block installed vinyl windows, and I can tell from the street they are vinyl. I wanted something that fit the age of our house, and these ones are designed to meet 'historic design' criteria. Our house is not 'historic' by any means, but I still wanted real divided lites that didn't look painted onto the glass. And even though they are wood, they are very energy efficient and qualify for the Tax Credit, so we will get 30% of our cost back. 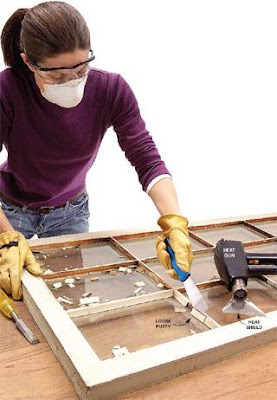 Many also believe that a quality wood window will outlast vinyl. Seeing as how all the rest of our windows are in great shape after 70 years, I'm inclined to agree. What was the cost? Well, it was $2400 (talked down from $2586) for the windows and the installation. Then we paid a company $300 to paint them for us. Why on earth did I have wood windows painted? Because all the remaining windows in our house are white, and I'm not replacing any more original windows. I could have painted them myself, but I already have an entire house of windows to paint, thanks. I also will be re-glazing some of our original windows as the weather warms up. Looks like a party, eh? Bottom line: we paid $2700 for two 5 ft tall windows and new cladding on the outside of the house. A lot of money, but worth it to me. I could have found a better deal, but the contractor is local and in business for over 13 years, and that was important to me in case we have problems down the road. What was the actual window cost vs. installation cost? We don't know for sure, but I'm guessing with the options I chose, $600 per window and the same amount for installation. I do think we got our money's worth because the 2 installers took around 7 hours to put in the two windows! Which means it would've taken us 3 years to get them in ourselves. Or, that they were incompetent. Only time will tell, I guess! Have you replaced windows recently? How did you decide what to buy? ANYway, you definitely made a good investment here, and at least you'll recoup some of the cost with the tax credit. I'm sure spring can't come soon enough for you! What a timely post! Windows will be our next big purchase in the very near future. Most of the 20 windows in our home need replacing. We have most of the $$ saved for this, I think (hope). I have not even started the research. Thanks for the tips you shared. (65 year old) windows this spring, as well and oddly enough I'm excited about the process. And a side note, according to the US Dept. of Interior any building over 50 years old is considered historic, so I think it's safe to say that your 70 year old house is indeed historic. Windows are something I've been "sweeping under my brain's rug" if you will. I need to replace the single-paners but I just keep putting it off. I should have motivation, because the bf says that my house is pretty much incapable of getting above 65 degrees since they are so bad (ouch). My kitchen window has the same problem- it was painted shut and won't open. I've been thinking of getting one of those garden windows but I know they're kinda ugly from outside. Well anyway, yours look great! Love your windows and so jealous because we can't replace ours due to "historic" regulations. BLAH! Single paned OLD OLD OLD windows for us! Great post!! Thank you for including the cost too. We first saw our house back in May and immediately loved the original windows that filled the house (26 to be exact). The house was build in the 30's and the windows have NEVER been painted. We got lucky. However, they only single pain and pretty drafty. We looked into getting replacements (but were adamant that if we did, they would have to be wood and would have to be the same style as our current windows). No way in hell was I going to replace them with white vinyl. However, all the quotes I was getting were AT LEAST $1k per window. So do the math and that is over $26k JUST for the windows, not to mention the cost of having them installed. That option was way out of the picture. Our solution, we are having storm custom made for our house, to match what was originally there (we still have remnants of the hardware that used to hold the storm windows). While it might not be as good as the high energy efficient windows, it will help a lot. The cost….only about $2500!!! We also got a quote for repairs (reglazing, replacing some dividers, priming and making some of the nailed shut casement windows functional again. The cost for that, around $3500. So $6k and we will have windows that look as good as they did new. Thanks for this post!! Windows are on our short list but we've yet to price anything out. People aren't kidding when they say windows are expensive. Thanks for including the prices. That's really helpful. So far, I have replaced 3 windows in my 1907 house. They were double hung with the top sash painted shut. I did find the original storm and screens in the rafters of my garage. Happy that the previous owner that replaced with with aluminum storms/screens had the sense to save them. They had mullions which I could not get replicated in the replacement windows. I opted to go with vinyl because I am reusing or replicating the interior casing and the walls were thick enough where I can use the storms & screens to restore that look. I don't remember what I paid for the 1st two windows because they were tied into my bathroom remodel last year. The window I replace a few weeks ago is 4-feet wide by 6-feet tall. I paid $500 for it & was installed with the help of my friends for the cost of a spaghetti dinner and a 30-pack of beer afterwards. Just think of the energy savings and the cost is so worth it. It's amazing to feel the difference between modern windows (what I have currently) and old fashioned ones (what I had in Boston). It's funny...just the other day, I told my boyfriend about how my father used to have to hang storm windows in the winter. He'd have to put new weather stripping on them each year, then hang out the window to get them hooked, then fight to pull them shut and hook them. I had that same kind of window in Boston, but we never took the storms off. Ugh. Your new windows look spectacular! Bonus points for getting a tax credit. And the bronze latches... very fancy! Very nice! Marvin windows are great quality. You'll be enjoying them for many, many years to come. We're replacing all 18 of ours over the next couple of years. But if you wanted white windows you didn't you just get fiberglass windows? They will never rot from condensation and will never have to be painted again (the reason you had to replace the old ones). And why did you pick replacement windows over new construction? In replacement windows the R-value of the glass doesn't matter much since you loose most of your heat transfer through the jamb which is compromised by installing replacement. The increase in work/install price is well worth it for all new windows. I love a good whacked out previous owner... I've got one that we've actually 'verbed'... we have many Cervenka-ed projects around the house. I'm so jealous of your new windows... we've got a super cold freezing room - the old windows might be the solid part of it actually. We have plans to take it apart - re-insulate it and re-window it this year. I actually had painted shut windows also in my home when I moved in. That was the first thing I did, was get new windows. I couldn't open any windows and have no A/C in the summer. I miss the look of them, but am happy I bit the bullet. Your windows look very nice!! Hailey - I read your post about your windows awhile ago, and I think you are picking the perfect solution. Original is always better, in my opinion! Our storms are in great shape, so we are going to keep our old windows as well. Bonnie - you got an awesome price, and that is great that your friends helped you with the install. Seeing how long it took professional installers to do ours, I think that scenario would have ended with us putting plastic over a big hole for a week. We have a brick exterior, so I didn't want to mess with it. Threeacres - Good question, I thought the Marvin fiberglass windows looked plastic. They also come pre-finished in a 'stone white' color that wasn't the same white as our trim. It looked dirty next to it. My painter was able to paint the windows using our trim paint. And we did replacement windows because the contractor recommended it. We were doing the same size window, our frames were in near-perfect shape, we didn't have a draft even with the old windows, and we wanted to keep all original trim without worrying about breaking it during removal. We only lost 1 inch of glass on either side, so it was a good choice for us. Beautiful windows. Good energy efficient windows are worth whatever you pay, and I think it is wise to have them professionally installed. Love the bronze latch ... might as well have what you want, they are there for a LONG time. We replaced ALL of our windows as soon as we moved into our home. It costs us a pretty penny but it was soo worth it. As to how we chose the company? Aside from lots of research, we went with a company we had seen working on a home in our neighborhood. We thought the outlook turned out great so we gave them a call. No regrets whatsoever. Oh and not to mention the crew to 15 men who replaced all 14 windows one day! Totally worth it. Well, they may have been pricey, but they look divine! Our big purchase on our house, so far, has been gutters. US Bank told us the day before close that we would have to completely replace the gutters within 60 days. They cost us $3,400, with the gutter shield and installation. And that was talked down from $4,500!